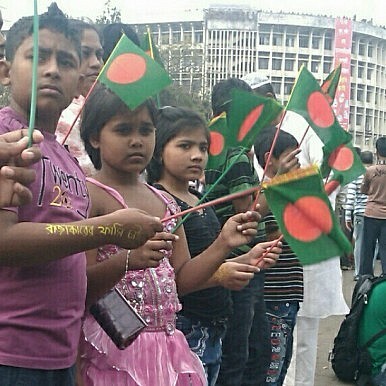 Bangladeshi politics are currently mired in crisis around questions of national identity. In August this year, when I was in Bangladesh, a common theme of concern among the people I spoke to was the looming uncertainty in the country. Masud Rana, an informational technology professional, had started preparing for the hard days ahead. He bought a second-hand motorcycle to commute from his home to his office, to avoid taking the risk of traveling by his own car during the protests. In 2007, his new car was torched by protesters when he was driving down to his office during a week-long general strike. Rana’s fear was not unfounded. The capital Dhaka and other parts of the country have been witnessing a series of shutdowns and violent protests in the past few months. Violent protests and large scale destruction have claimed more than 100 lives so far across the country and the crisis shows no signs of abating. At the center of the continuous political crisis is the 10th parliamentary election, but a larger issue is at hand: the fight between moderate and secular forces on the one hand and radical Islamic forces on the other. Ever since democracy was restored in Bangladesh in the early 1990s, the country has been marred by a deep distrust between the two main political parties – the Awami League (AL) and Bangladesh Nationalist Party (BNP). This distrust stands in the way of strengthening democratic institutions, such as the Electoral Commission (EC). As a result the main opposition does not want to run for elections while the ruling party controls the EC and is demanding the formation of a neutral government to oversee the poll. This issue led to a logjam in 1995 and 2001 and the suspension of democratic processes between 2006 to 2008. When the Awami League government, led by Sheikh Hasina, came to power in 2008 with an overwhelming majority, it nullified the system of caretaker government despite opposition from rival political parties. Despite the constitutional amendment, the BNP is not willing to participate in elections unless its demand for a caretaker government is met. Intervention from the international community and the United Nations has failed to bring any kind of reconciliation between the major political parties. The general elections on January 5 would be held without any participation from the largest opposition party and its alliance partners, thereby raising serious question about the legitimacy of the electoral process and the future of Bangladesh’s nascent democracy. The ruling party has already won more than 150 seats unopposed in the House, out of 300 total, and the polling in early January will be a mere formality. Is the chaos in the country only related to elections and the caretaker regime? The main fight is between radical Islamic forces, led by Jamaat-e-Islami and the madrassa-based Hefat-e-Islam, both of whom are allied with the BNP, on the one hand and the secular and pro-liberation political coalition with the Awami League as its head on the other. The battle between these two opposing ideological coalitions became more pronounced after the setting up of Bangladesh’s International Crimes Tribunal, which is prosecuting war criminals who sided with Pakistan and indulged in violence against Bangladeshis during the country’s liberation movement in 1971. Earlier this month, a prominent Jamaat-e-Islami leader, Abdul Quader Mollah, became the first prominent leader to be sentenced to execution by the tribunal. His hanging stoked violence in several parts of the country. The BNP has been a loyal ally of the Islamic group and it patronized many of its radical leaders during its rule. It is this link between the BNP and the Islamic radicals that has come in the way of any negotiated settlement with the ruling Awami League. However, Dhaka-based political analyst, Piash Karim, who is widely believed to be close to the BNP leadership, blames the Awami League’s rigidity for the present chaos in the country. Speaking with The Diplomat, Karim says that the war crimes tribunal is flawed and prejudiced and that it serves to prosecute political opposition. But Reza does not agree with Karim and holds Jamaat responsible for the current mess in the country. “Jamaat has links with international terrorist organizations. They kill people and destroy public transport, like buses and railways. This is not a normal protest. [The] overwhelming majority of the new generation opposes the Islamic radicals because they carry the stigma of war criminals due to their dubious role in Bangladesh freedom movement in 1971,” says the Dhaka-based journalist. Given the crisis, India’s role has come into question. Bangladesh’s neighbor was instrumental in liberating the country from the Pakistan army 44 years ago. Therefore,the largest democracy in South Asia holds a special place in the hearts of Bangladeshis. New Delhi plays a great role in deciding the political direction of its eastern neighbor, considering the proximity the ruling Awami League enjoys with political leadership in India. “India, for the first time since 1971, has lost some credibility in the eyes of the people of Bangladesh. The impression among a section of the populace is that New Delhi has failed to guide its junior brother in this hour of crisis. This failure is not because of political leadership but because of lackluster diplomacy,” says Dr. Aman. Why has Bangladesh failed to nurture and strengthen some of its basic democratic institutions, like the Election Commission, despite having more than two decades of experience with democracy? “In Bangladesh there is a deep-seated problem of political trust between the two main political parties. This distrust is rooted in history. The seeds of distrust were laid when Islamic groups opposed the idea of Bangladesh and later on extremist religious groups found patronage at the hands of the BNP. This is the reason that institutions like the Election Commission are not strong and independent in the country. Bureaucracy is divided along political lines and civil society also plays partisan roles,” says Reza. The questions that Bangladesh faces do not have any easy answers. They are rooted in the very idea of Bangladesh: a predominantly Muslim country separated from Pakistan in 1971 on the question of its linguistic and ethnic identity. The fight in the country is to maintain and preserve this distinct character. Bangladesh’s Bumpy RideCan an Aspiring Political Movement Upend the Bangladeshi Elections?Death Toll Rises in Bangladesh’s Anti-Drug WarTurbulent Politics Set to Return to BangladeshIs This the End of the Two-Party System in Bangladesh?